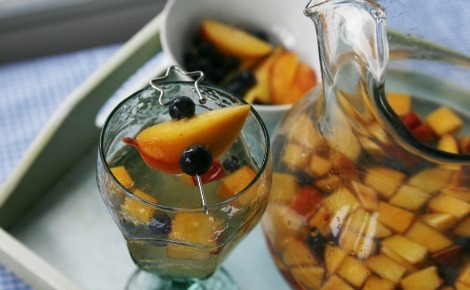 Break out the chilled white wine and turn it into something special with this recipe for blueberry peach sangria. It all started with a whisper... oh, wait, that's a song. No, actually, this recipe started with National Peach Month which is happening right now. Peaches are ripe and in season right now, so naturally August is a time to celebrate them and their deliciously sweet flesh. It also happens to be blueberry season. It's all like a match made in celebrating obscure holiday heaven. And this pitcher of sangria totally does the trick. 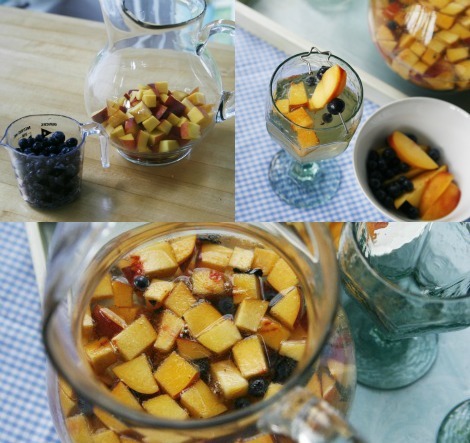 To make this super easy, refreshing sangria, pour into a pitcher some diced fresh peaches and muddled blueberries. (Hint: Muddled is a fancy word for a little smashed.) Then, you add some chilled Moscato and stir. Chill it until it is ready to serve. And when you serve it up, make sure you dish out some fruit too. The Moscato wine is a sweet-crisp wine that can be enjoyed as a table wine, but also shines as a dessert wine. It's perfect in this recipe because it complements the flavors of the blueberries and peaches so well. 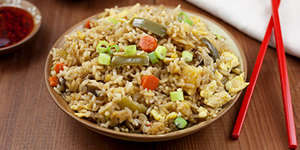 With its sweet fruitiness and super ease of preparation, this recipe is just right for a hot summer day. Pour yourself a glass and enjoy! Cut three of the peaches into a dice. Add to a glass pitcher. Cut the fourth peach into thin wedges and set aside. In a bowl, lightly muddle the blueberries. Add to the pitcher. Pour the Moscato into the pitcher and stir gently to combine. Chill until ready to serve. To serve, make sure each glass gets fruit from the pitcher. Then, also skewer some fruit on a drink pick for a garnish. 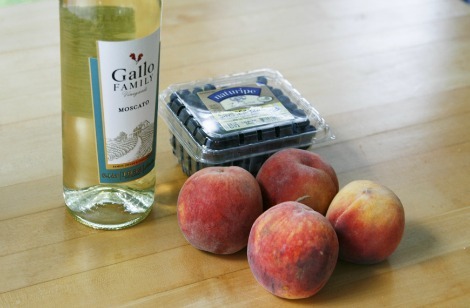 Moscato is a sweeter wine and the blueberries and peaches add sweetness to this drink. There's no need to sweeten it any further. If desired, add ice cubes for an even chillier experience.